Mel Pinet, an expert in babywearing at Wrap a Hug, gives us the lowdown on everything you need to know about babywearing. Both Jo and Lauren at the Mother Side carried their babies in slings and carriers, and found it not only a lovely experience having their little ones close (and so handy for naps on the go), but also incredibly convenient and easier than lugging a buggy around (especially in busy places like London!). There are so many different types of slings and carriers to choose from, and also some really important things parents need to know about the right way to carry, so we invited Mel Pinet (an expert in babywearing at Wrap a Hug) to share with us her knowledge and advice. Carrying your baby and toddler is natural, convenient and easy. Getting it right is also crucial. Carrying your baby is a natural act, and for many parents babywearing is a way of life. Babies thrive when being held close to their parents. It helps them feel calm, secure, and content, and the closeness forges a strong bond between a baby and his parents. Slings promote this closeness by enabling parents to carry their baby in a comfortable, safe and secure manner and babies can be carried from birth until well into toddlerhood. The benefits to babywearing are countless. Think ‘hands-free’, naps on the go and stress-free to transport. Slings come in a variety of styles, colours, sizes and material. The choices can be quite overwhelming at first, so try before you buy! Sling libraries are a great place to see the range of slings available, try them on with help and get expert advice. 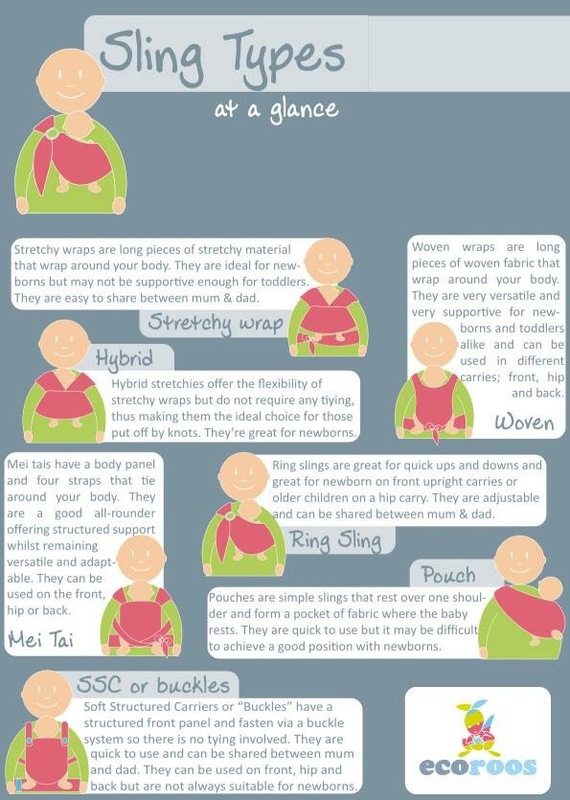 Age appropriateness and sizes: some slings, such as stretchy wraps, can only be used during your baby’s first few months of life, while others are only suitable for older children (e.g. some types of soft structured carriers are not suitable for newborns). Other slings such as ring slings and woven wraps can be used from birth to pre-school age. Types of carry: some slings can only allow for front carries (e.g. stretchy wraps, some buckle carriers) while others offer all types of carry (e.g. woven wraps). Where to get a sling and advice? Buy new: You can buy directly from the manufacturer, sling retailers, on the high street (with limited choices) or in Facebook retail groups. Be wary of counterfeits on non-specialist websites! Buy second-hand: One of the best places to get a used sling is from one of the various Facebook resell groups where you can also put out a call for a particular sling. This is a friendly community where you can also get advice. Hire from a library: Try before you buy! Sling libraries are a fantastic place where you can try on different slings and get expert advice. If you prefer having a longer one-on-one session, then book yourself onto a private consultation with a qualified sling consultant! When using a sling, you need to be very aware of safety. Your baby must be in view at all times, his airways clear, positioned at a height close enough for you to kiss his head, with the sling tight across his body to prevent slumping and give him good support. Think ‘TICKS’. Be mindful of your activities when babywearing (e.g. cooking, holding a hot cup of coffee) and try to keep your hands free. Make sure your baby doesn’t overheat in the sling by favouring thin layers over thick and bulky layers (snowsuits are not recommended). Keep the extremities warm and remember that the sling counts as one layer. 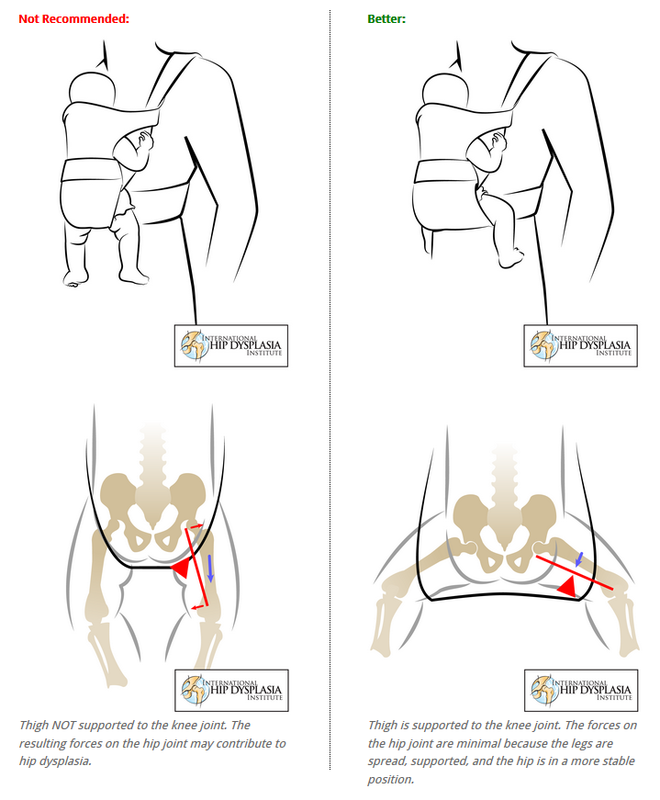 – Positioning: Your baby should be seated in the optimum position (the ‘Spread Squat’ or ‘M’ Shape position) with his hips spread around the carergiver’s torso and the hips bent so that the knees are placed slightly higher than the buttocks with the panel covering from knee pit-to-knee pit. This position promotes healthy hip development, and can be achieved using a wide-based carrier as compared to a narrow-based one. Correct hip support is vital. – Facing out: Some carriers allow for the baby to be carried with his back to the carergiver’s torso or ‘facing out’. Carrying in this position is recommended for a maximum of only 20 minutes at a time. This is because babies can feel over-stimulated, and are unable to turn back to face their carer for comfort and reassurance. It is also not recommended to let your baby sleep in this position. The support is not optimum, airways can get obstructed (e.g. if his nose becomes pressed against the panel), and it is difficult to monitor your baby in this position. Carrying your baby is a wonderful experience that has a long lasting positive impact on your relationship with your child and countless benefits. With the right support and advice, you can enjoy all the benefits the sling offers and hours of lovely cuddles with your baby! Find Mel on her Facebook page, and her website Wrap a Hug. Find and follow us on Facebook.